Quintet.net is an interactive networked multimedia performance environment invented and developed by composer and computer musician Georg Hajdu. It enables up to five performers to play music over the Internet under the control of a “conductor.” The environment, which was programmed with the graphical programming language Max/MSP consists of four components: the Server, the Client, the Conductor and the Listener. In addition, there is a Viewer add-on for the Client and Listener components. The players interact over the Internet or local networks by exchanging musical streams (control messages) via the Quintet.net server. For this, various inputs ranging from the computer keyboard, MIDI controllers, sensor input and/or the built-in pitch tracker can be used. On the server, the streams get multiplied, processed by algorithms, and sent back to the clients as well as to the listeners. In addition, a sixth performer, the conductor, can control the musical outcome by changing settings remotely and sending streams of parameter values either manually or by utilizing a timeline. The environment uses two network protocols for exchanging data: OpenSoundControl/UDP for time-dependent events, as well as TCP for safe data transmission. It also uses a mechanism to compensate for network jitter. Quintet.net’s open architecture accommodates various outputs such as the built-in sampler, MIDI as well as VSTi instruments and custom designed software patches for instrumental playback. It also features granular synthesis controllable by the players and the conductor. 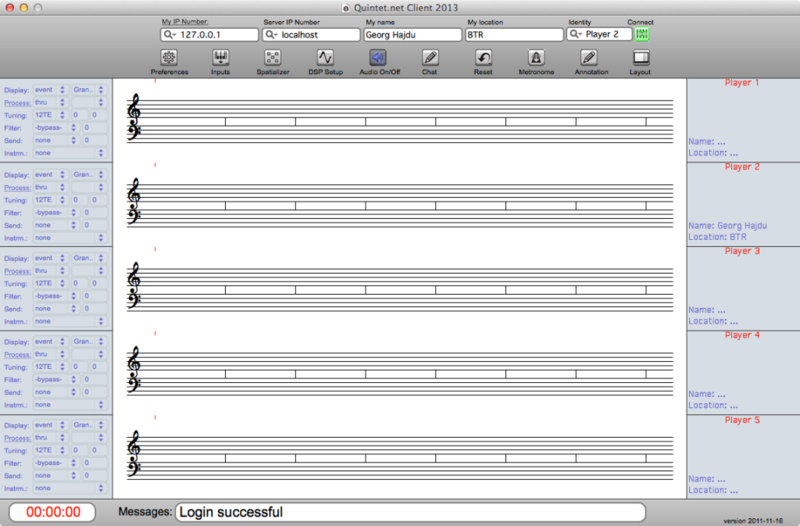 Quintet.net’s notation layer allows for better interaction and control on a symbolical level: The performers see the music that the participants produce on screen in “space” notation on five grand staves. The conductor can also send musical parts, which are displayed on screen and played back by the performers–all in real time. The Viewer add-on allows the realization of full-fledged multimedia pieces by taking advantage in a modular environment of the Jitter video processing capabilities. Thus, users can easily add new processes. The server also implements a sophisticated mapper/sequencer which allows to map any input to any output, be it musical or visual. The music performed with Quintet.net is a combination of composed and improvised elements. The lack of real synchronicity due to the usual delays on the Internet, necessitates the adaptation of a genuine “Internet” performance style for which John Cage’s number piece could be considered a model: Cage requires certain notes or phrases to be played within “time brackets.” It comes as no surprise that one of the first pieces realized with Quintet.net is an Internet version of the 1988 composition “Five” for 5 performers. Local network performance, of course, can be played with unlimited precision.